This is a guest post by Michael Westphal. It is his account of his field trip, executed on the central California coast with the sole objective of collecting six closely related sand-dwelling surfperches, in a single day. This journal accompanies Life History of the Livebearing Calico Surfperch, Amphistichus koelzi (Teleostei: Embiotocidae), which Mike presented July 17, 2015, at the Joint Meeting of Ichthyologists and Herpetologists, Reno NV, USA. 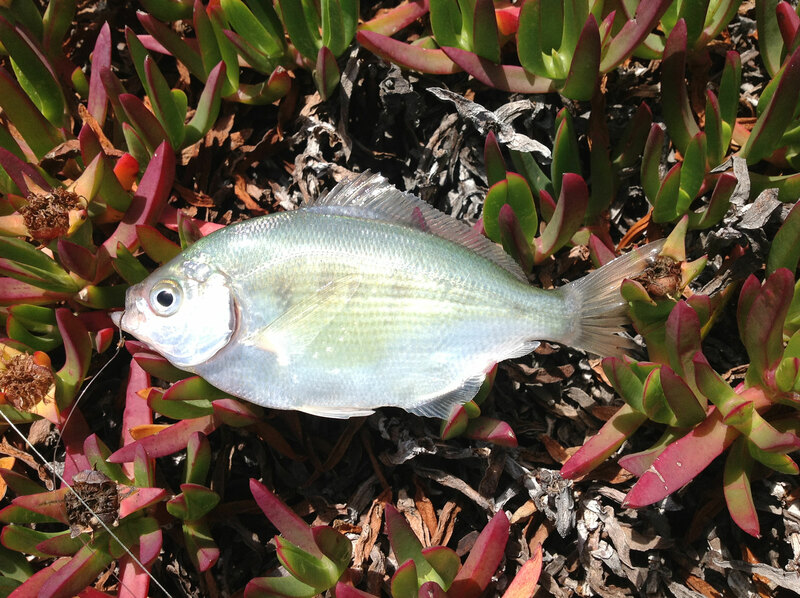 Mike was introduced previously on theoutershores in Surfperch Summit. While developing the slideshow that would accompany my talk at the Joint Meetings of Ichthyologists and Herpetologists in Reno, the idea came to me to compose a slide showing actual surfperch specimens arranged in phylogenetic ( ‘family tree’) order on a Sabiki rig, which is a multiple-hook line commonly used to catch small fish for bait. It would be a novel and humorous way to present a phylogeny to a group of scientists and would simultaneously make the points that 1. I was collecting these fish via hook-and-line, 2. that all six species in the subfamily are closely sympatric (= they live in the same place). One good slide can really stick with a viewer and data presented visually can often be more compelling than a table of numbers. I am therefore a true believer in making every slide in a presentation count, and I’m willing to expend substantial effort to get the perfect picture. The fish in the picture needed to be as fresh as possible, so I set out to get them in one 24-hour period. 8:53 AM I leave Hollister, embarking on my attempt to to collect all six species of the sub family Amphistichinae in one day. I am also transporting my final load of frozen fish to San Francisco state for Mike Izumiyama and I to process prior to my talk at JMIH 2015. 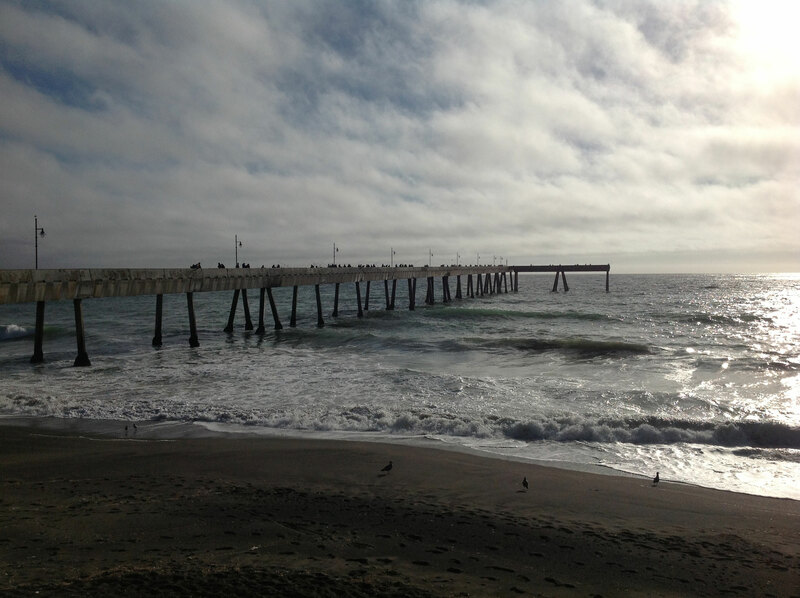 9:47 AM in position on the pier, incoming the surf is low but there are visible breakers and it is choppy. In my experience these are pretty good conditions for surfperch. 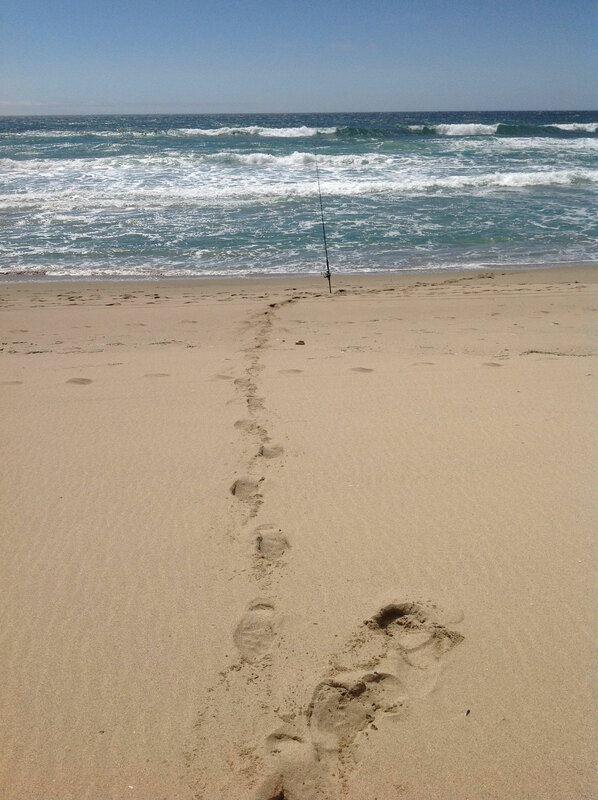 I am the only one fishing in the surf today. This is typical; usually only experienced fishers fish at the surfline. I suspect that recreational fishers and inexperienced fishers have the intuition that going deeper will equal bigger or better fish. Not a bad intuition as intuitions go, but little do they know that beautiful fish can be found in inches of foamy water. 10:07 AM. I get my first fish of the day, a beautiful male barred surfperch well over 20 cm long! True to my quest I will now abandon the surf and go a few meters seaward to fish for the slightly more pelagic walleye surfperch. 10:30. 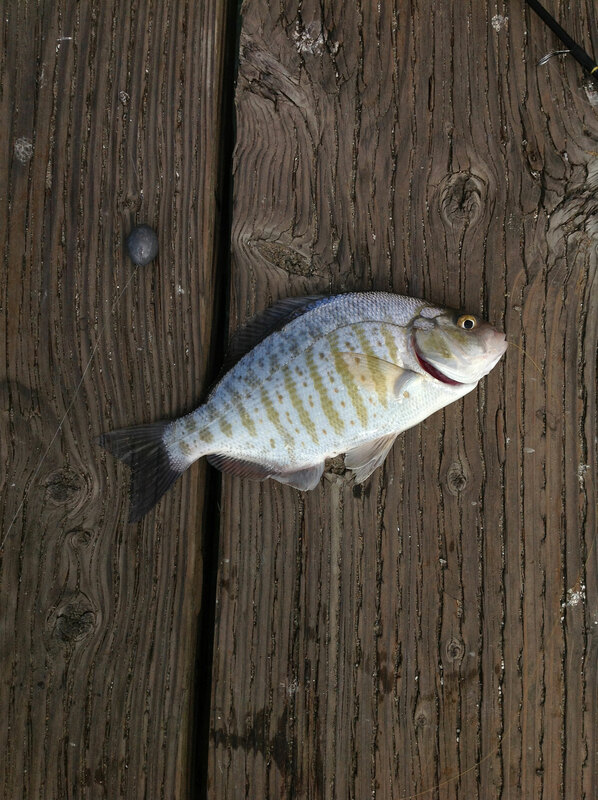 I catch a shiner surfperch — an embiotocid like the walleye, and like the walleye, fairly pelagic. But this fish is in the wrong subfamily! 11 o’clock. I’m quitting the pier and heading north. I have caught four more shiners and I have no desire to feed my hard-won bait to those guys. I should be able to get walleyes at the other sites, but it is ironic that I get the coveted barred perch on first cast, then spend the next hour fruitlessly trying to catch the much-more more common and abundant walleye surfperch, with no luck. 12:34 PM. I arrive at Bean Hollow State Beach. The tide crested a couple of hours ago, but this pocket beach can be good for calicoes and my impression is that they tend to bite on the outgoing tide. I set up my gear in my usual spot on a low iceplant-carpeted clifftop on the south end of the cove. I find that this vantage allows me to cast parallel to the beach, or even towards the beach, giving me access to a cross section of depths. I will still rig up as if fishing the beach, using the 10ft surf rods with 4oz pyramid weights and two hooks. Crossing fingers! 1:02 PM. 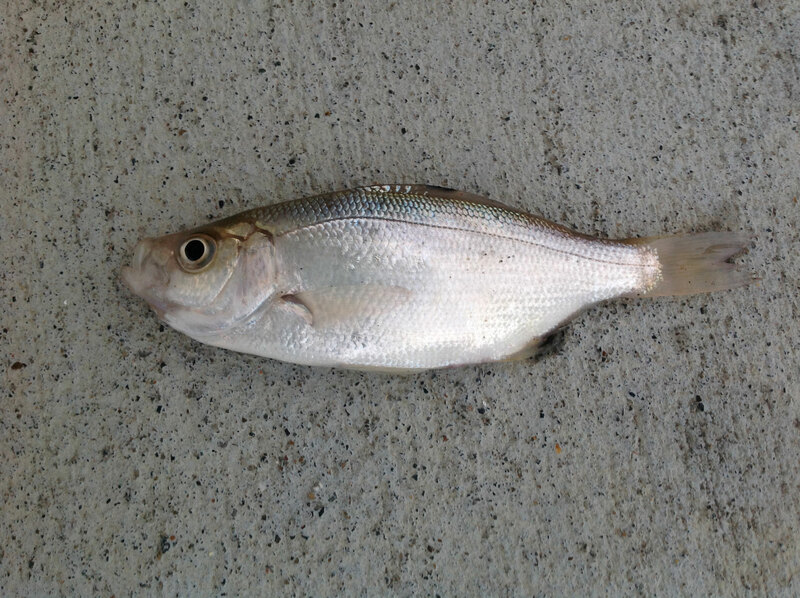 I catch my first silver surfperch on first cast! The water looks great. 3:00 PM. Got seven silvers, nothing else. 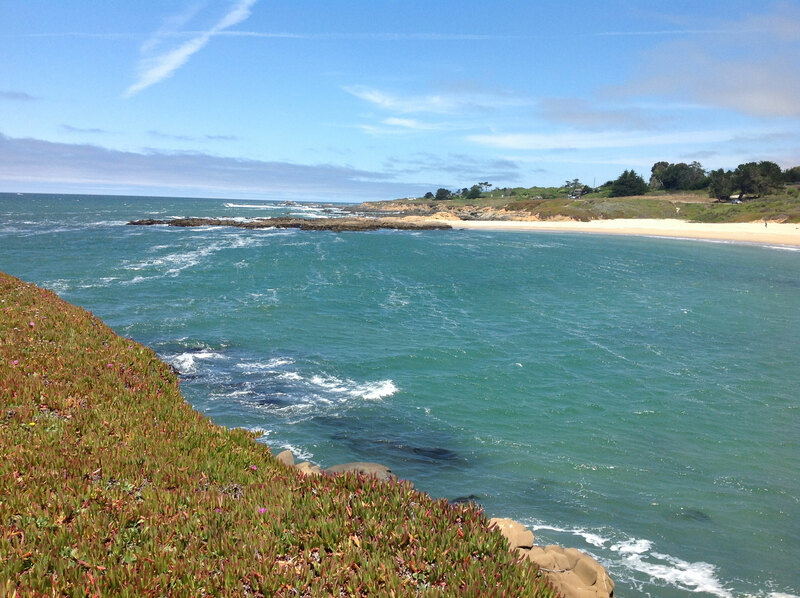 Concerned that rising wind will make Pescadero and/or Pacifica unfishable. Leaving Bean Hollow. 3:18. 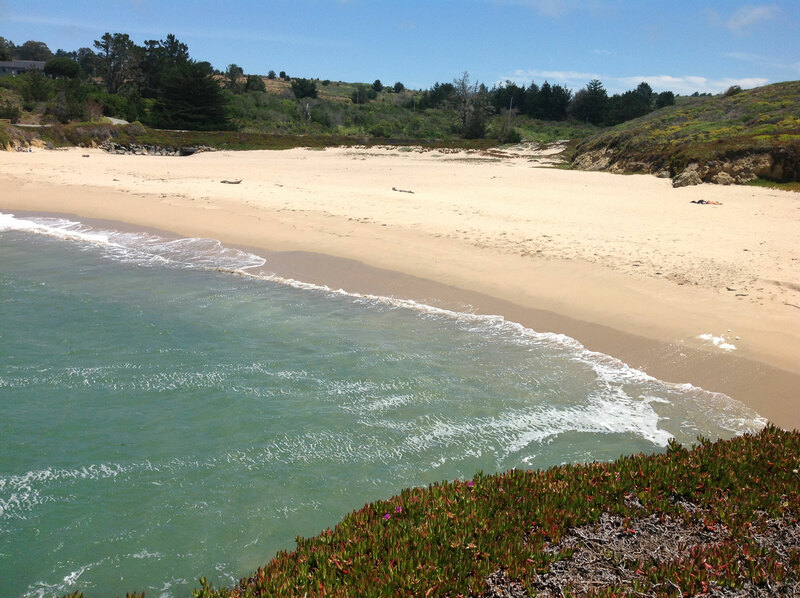 At Pescadero and suited up. clear, warm, windy. Going to play the hole that Ken Oda showed me and Gary a couple of months ago. 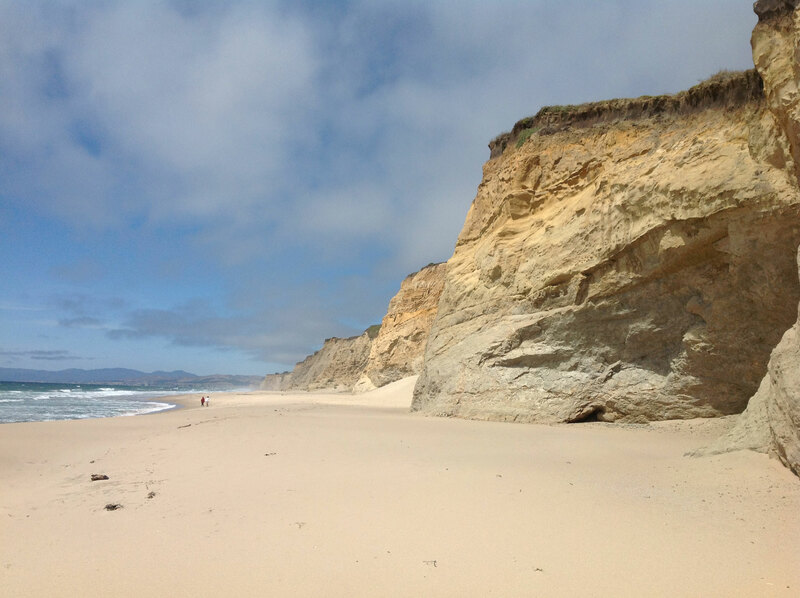 This beach marks a transition from a rocky coastal landscape to the long beach habitat that reaches from here up past Pomponio and San Gregorio creeks, an unbroken strip of sand 100 feet wide and several miles long at the base of looming 100ft cliffs. 3:30 First cast, irony again! It is the “gold” morph of Amphistichus argenteus, a fish I have long sought. Such an amazing specimen –but I came here for a redtail! I also get a jacksmelt, but no redtail. 5:43 Leaving Pescadero, racing the clock now to get to Pacifica and get my spotfin! 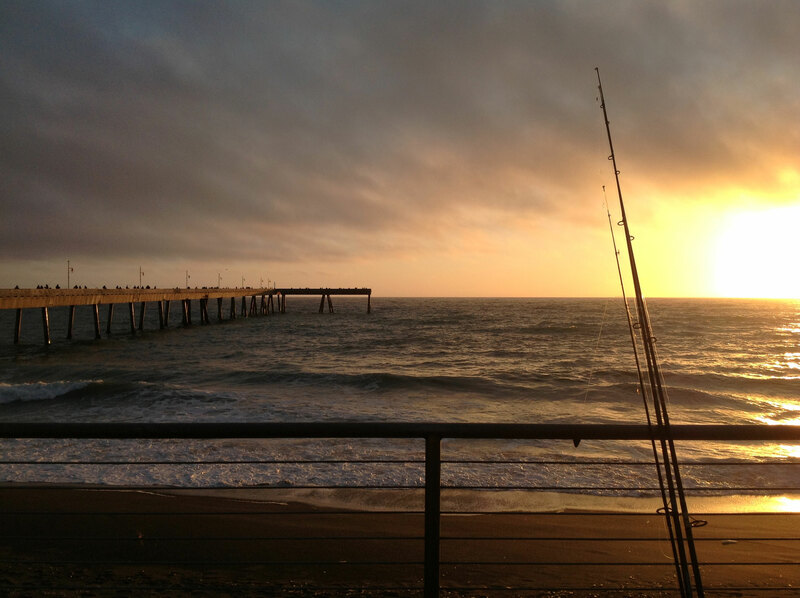 6:30 PM Arrive at the Pacifica pier to find it crowded with fishers. Striped bass are biting and one family has already caught two decent sized bass. 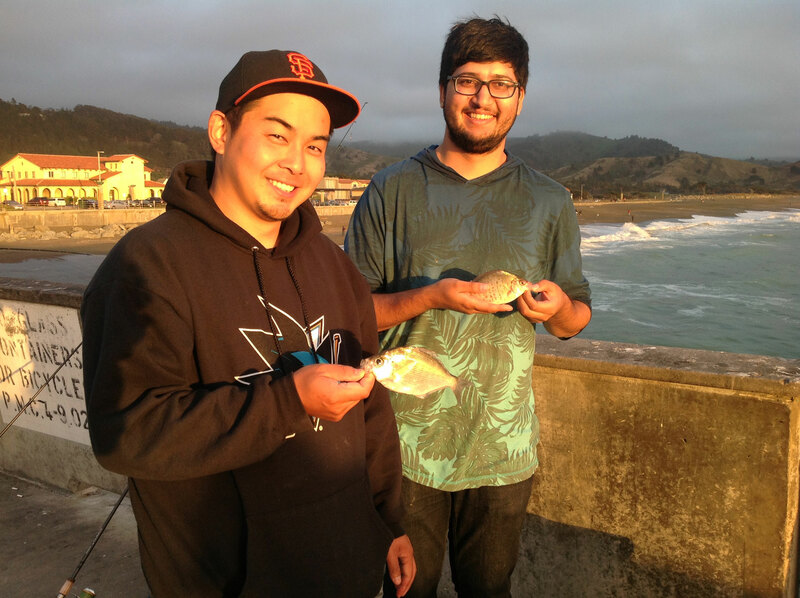 Mike Izumiyama and Saad, an undergraduate from Karen Crow’s lab, are already there. The water is roiling but not unfishable and they have already caught a couple of walleye surfperch and a calico perch, as well as some silver surfperch. Mike tells me he hasn’t seen spotfin here for several weeks but when I walk out seaward I find a fisherman’s bucket containing a mixed collection of shiner surfperch and spotfins. 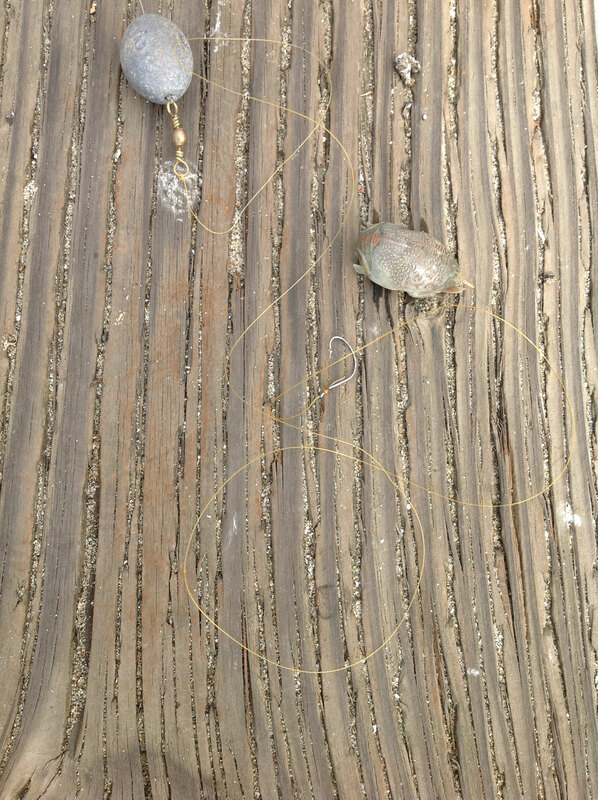 I immediately set up a Sabiki rig and bait it with shrimp. 8:40 Was unable to catch anything but shiners! 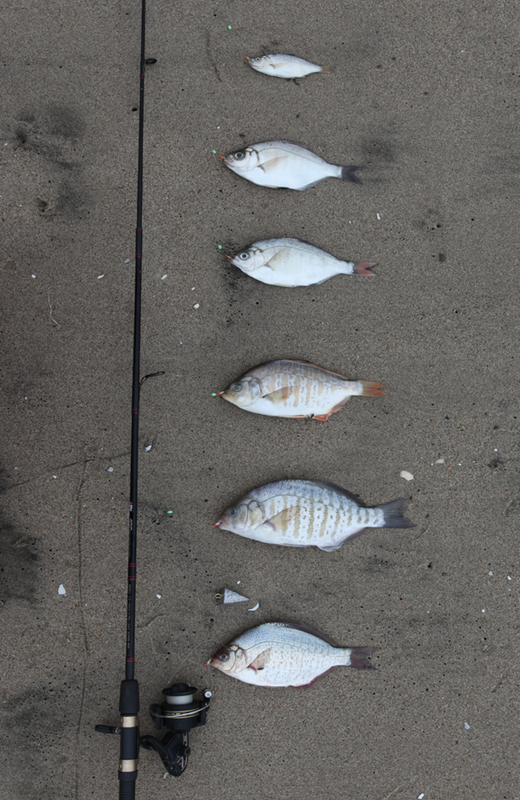 Mike offers his calico and walleye as contributions to a Team Surfperch sexfecta. I go back to the family with the spotfins and offer to trade them one of my shiners for a spotfin. They are surprised to learn that they have two species of perch in the bucket! I point out the salient features of spotfin surfperch and tell them that the spotfin looks like shiner perch but is actually more closely related to the walleye. Hearing myself explain this to them, I am reminded of something Giacomo Bernardi said after we learned that spotfins were basal to the Amphistichinae (which Gary confirmed with his extremely robust phylogeny): that once you knew this, why would anyone have thought anything else — it made evolutionary sense. The family graciously gives me a spotfin, no trade necessary, and I leave the pier hoping to make it back to N. Peacadero in time to catch the high tide. 9:20 PM I get to N. Pescadero but the sun has long since set and it is too dark to fish. I resolve to come back in the morning — if I can catch a redtail by 10AM, I can still claim a Team Surfperch 24-hour sexfecta! 0700 Arrive at N. Pesacdero, dense fog, a mysterious and beautiful beach. 1000 Will have to settle for a nice day in the surf. Nothing took my bait. I will have to beg a redtail from someone else to make my sexfecta. I was under a time crunch afterward and knew that Steve Morey would have some redtails in his freezer, so I gave him a call. He sprang into action and with 48 hours I had my redtail. I took all my fish and photo equipment to the beach and arranged the shoot with the help of Steve Miller — no mean task to get all those heavy fish on the Sabiki and laid out on the beach without getting sand on them. It took some patience and a few retries, but in the end I got my image. Afterword: There was a point to this exercise besides simply getting bragging rights. The region of coast I explored during my quest is the one place where a sexfecta is possible, and could thus be the historical spot where the surfperch first radiated. Surely we can learn important things about the ecology of these fish by studyjng their behavior and habitat partitioning where they exist in sympatry. Even their morphology may reflect sympatry — it is no coincidence that the gold-morph barred is only found where barreds coexist with redtails, of this I am positive. 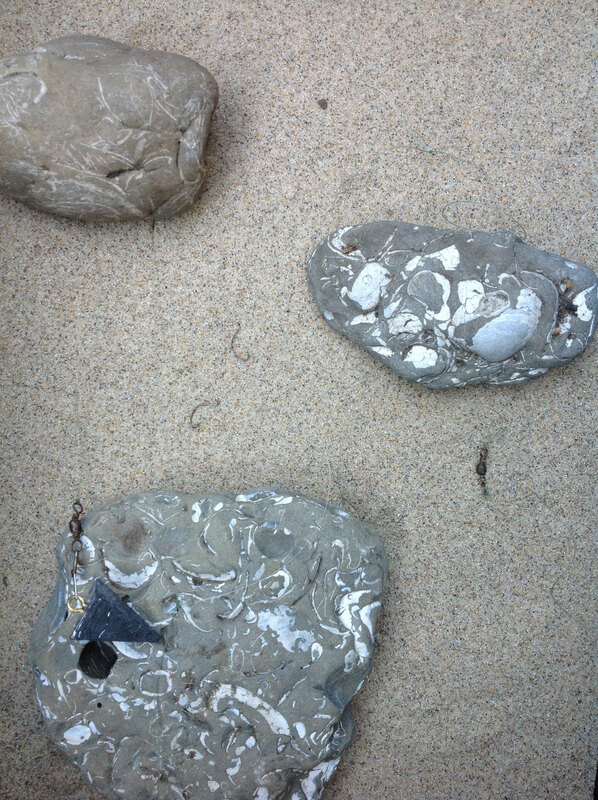 Also, each beach had its own unique characteristics and fauna. I believe this stretch of coast could be rich landscape to explore for more and deeper insights into the mysteries of the sand-loving surfperches. I was showing my pictures to a friend and she remarked that it was too bad that they all were of fish that were out of the water — dead, or on their way to being dead. I resolved therefore to get a picture of a live calico for my talk. I really liked Steve’s picture of a redtail in shallow clear water, but it wasn’t quite the vision I had. Instead, I wanted to put the fish in a clear, narrow vase so that I could get a full profile of the fish upright in the column, as if I was looking at it from underwater. It was only a week before the conference when I started planning the shoot. First I had to find the vase. I knew that movement of the fish would be a problem, so I needed something narrow, to keep the fish from turning. I envisioned a tall rectangular vessel, something that would be at home in a museum or a laboratory. Then, in the flower shop of Safeway, I saw a laterally-compressed circular vase that gave the illusion of being globular but which would hold the fish in one pose — the fish would look like it was in a fishbowl, which would add an extra thematic element to the picture. A fish in a bowl is a meaningful metaphor. My new vision would acknowledge that the fish had been captured, rather than perpetuating the illusion that it was in open water, and the photo would be a little more nuanced and interesting, I thought. Vase in hand, I was ready to catch the fish. I knew it would take a little work and that unexpected obstacles would crop up. The first and biggest obstacle turned out to be, I couldn’t catch a calico to save my life. 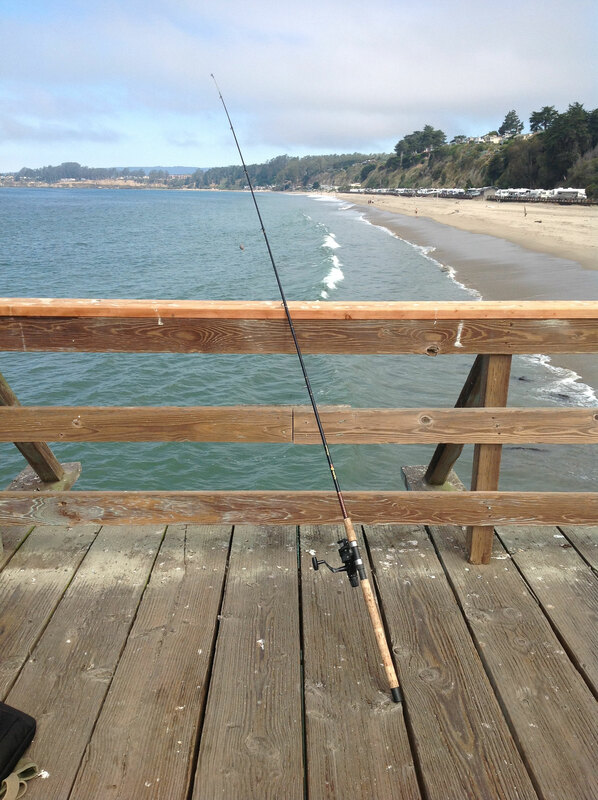 I traveled morning and evening daily to Seacliff beach trying to get that fish, but the only species biting were barred. I took the opportunity to test the shoot on barreds, and identified some key constraints. Of primary concern was getting the fish to hold itself upright in the bowl. I found that a barred perch that had been in the bucket for twenty minutes would not keep itself upright. The next trip I brought the vase and my camera equipment right onto the pier and found, to my surprise, that even a fish right out of the water would not stay upright — they would swim around the opaque white pickle bucket as if all were well, but as soon as they got in the vase, they started listing. Something biological was going on. By getting my hand in the vase I could goad the fish to right itself for a moment, so the shoot became that much more complicated — I needed to have dry hands to handle the Canon 5D, which is very sensitive to seawater. 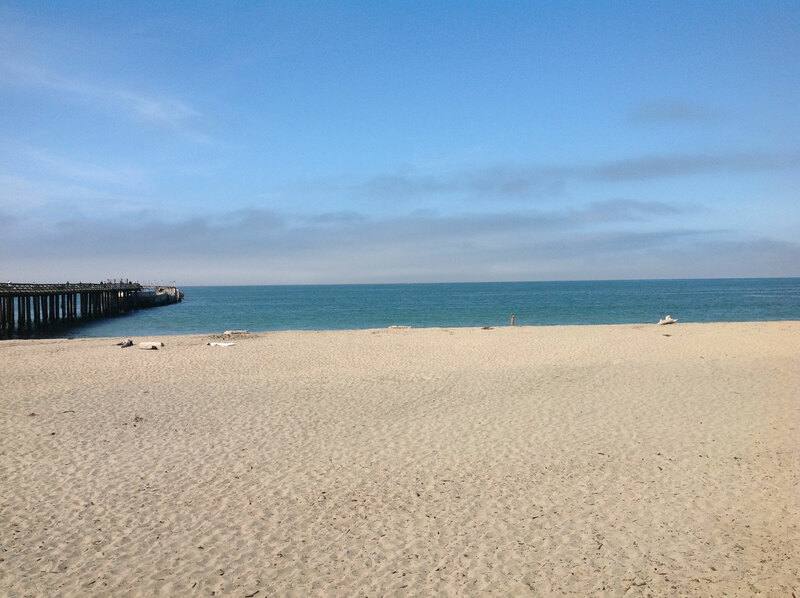 Then the idea came to me that instead of taking the picture with the bowl on the railing of the pier, it would look neat to have down on the beach itself, near the water. That was going to be challenging, as it would put the equipment at some risk of getting wet, and the camera doesn’t like sand getting into its moving parts. I started packing blankets, towels, a beach umbrella, other means to stage a controlled shoot on the beach. 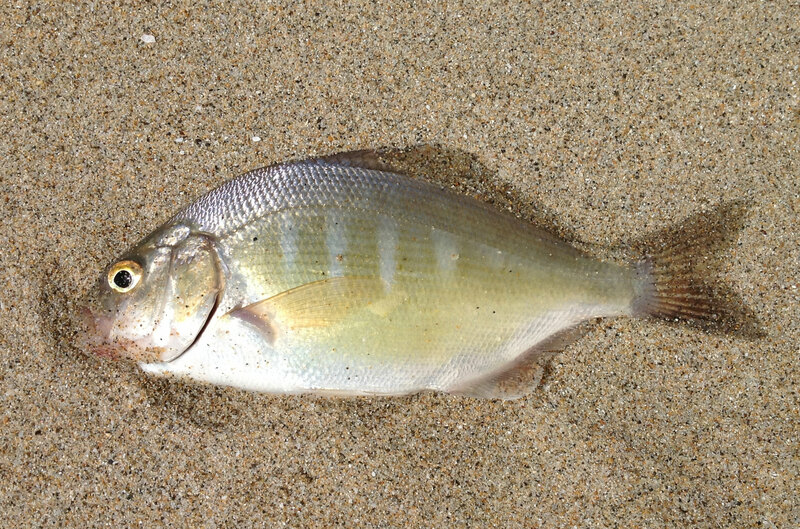 The work necessary to catch a surfperch is non-trivial. Obtaining sandcrabs by sieving the surf with a special tool takes a couple of hours, and is not particularly fun, especially when you’ve done it a few days in a row. It’s basically shoveling sand while being pummeled by waves. Also, fishing conditions can be sketchy. The tide and surf have to be just right, and the water is periodically too thick with kelp to making fishing practical. 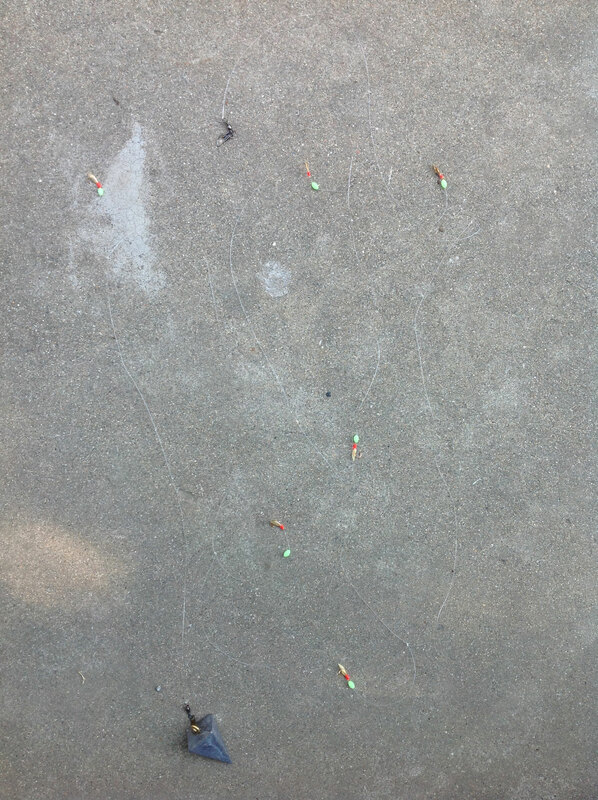 Calicoes are relatively easy to obtain in March when they consistently form a significant portion of the catch, but they are very spotty in July. With all these complications, I still could not catch the fish, and I was spending a lot of precious time trying. Finally, the Friday night came, four days before I was to leave for Reno, when I decided to give up on Seacliff and fish the sundown high tide at Bean Hollow, where I could sometimes get calicoes when they were not to be had at Seacliff. It would add an hour to the drive, but I needed that picture. It was not to be. 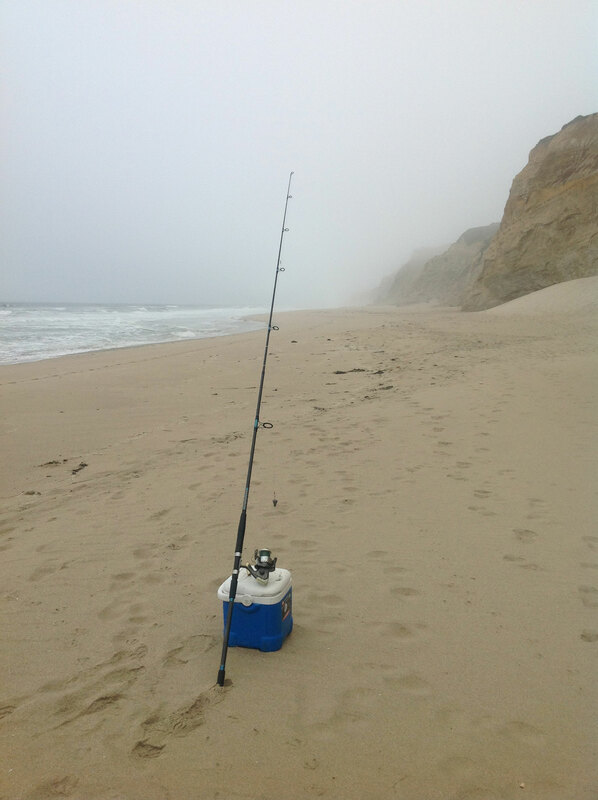 The traffic coming into Watsonville was at a standstill, and I knew that if I was going to make the hight tide, I would have to fish Seacliff again. The sun was going down, some good cloudscape was forming — if I got the fish, it would be good conditions for a shoot. 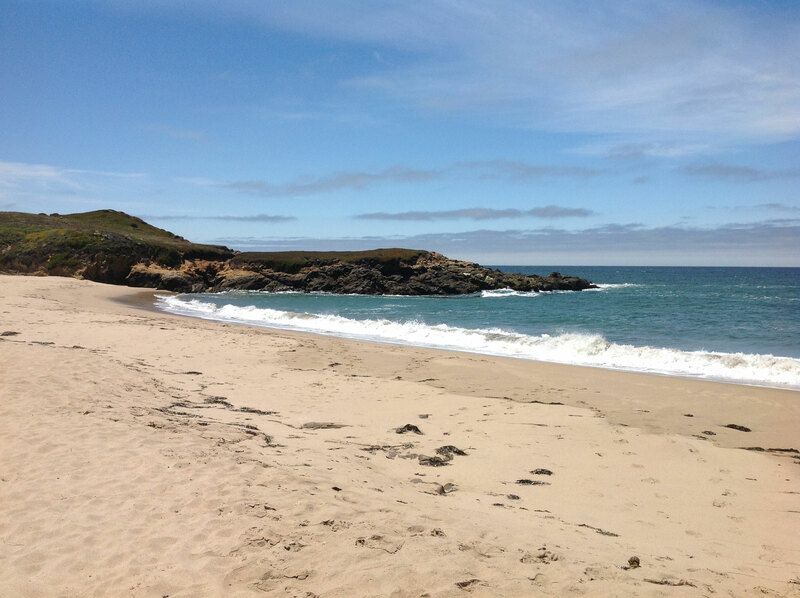 The tide was a 5.6 footer, pretty high for that beach, and giant waves were rolling in, cresting over a low cliff of sand that ran the length of beach, and forming large flat tidepools on the upper reaches. Every time a wave passed by, the pilings would shake like Lincoln logs. It was like being on a wooden ship on the open sea. It was challenging to cast down into that roil. I hadn’t had time to obtain sandcrabs, and only had store-bought shrimp to fish with, but I started in. Fish were biting. It was barred perch, but they were big, and just kept on getting bigger, the third one being a truly huge female. Even if I didn’t get my calico, the big barreds were a nice consolation gift. Then came the fateful tug, and I hoisted a beautiful male calico of just the right size out of a giant breaker. The sun was setting and I had no time to get the bulk of my equipment. It was difficult to stop fishing during such a great bite, but the picture came first. I snapped a few shots of the calico in the vase on the railing, and noticed immediately that the fish did not list or lie down like the barred all did — something biological going on, some behavioral difference between calicos and barred? File that one away. Whatever was causing it, it would make the shoot easier. I took the vase, shouldered my backpack with the camera equipment, and ran down to the beach. Another stroke of luck — a large group of people were on the beach having a picnic, and they would normally have churned the sand with footprints, but the waves were so high that the group had been forced to set up at the very top of the beach, and any footprints they had left near the surf had been swept clean by the periodic high waves. 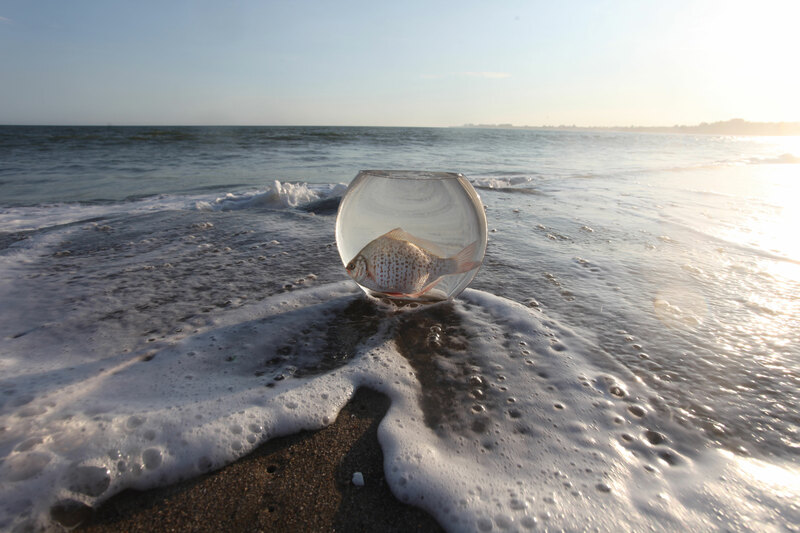 I set the vase on the very edge of the low cliff of sand I mentioned above, and lay down flat in the wet sand, waiting for the right wave to come in. When I lay flat it created the illusion of there being no cliff — that I was lying right in the surf. I knew the risk still was high that a too-big wave would come and take my vase and my fish — and I would have to be ready to spring upright, hold the camera high above my head if the wave came — but the next hundred waves behaved. Every dozenth wave would send a beautiful lens of foam coursing around the vase, and I snapped picture after picture, thrilled at how everything finally was coming together. I took over a hudred images and finally decided I had at least one good shot in the box, and got up. I had put the calico back in the bucket with the other perch I had caught and was picking up my camera bag when the big wave came. Suddenly I was knee-deep in water and there went the bucket tipping over, with my fish rolling up the beach. With the help of some folks who had stopped to watch the shoot I secured my equipment and managed to get the fish back in the bucket, but it was a close thing. I couldn’t help think that it was the Fish Gods playing one last trick on me, to remind me to be thankful that things turned out so well. I was. I got off the beach without further surprises,and went home to pick out the image that would add the perfecting bit of beauty to my talk. Next How Stable the Starfish? Mike, a great story. It reminded me of the adventurous fishing stories, albeit with much bigger fish! Liked your fish in the fishbowl. I didn’t finish my comment. It reminded me of the fishing stories in Outside Magazine. Hey Karen, thanks for the comments & the kind words! Doing talks at meetings is a big part of my life as a scientist and I think it matters to have compelling images to accompany the data in a presentation. I’m glad you enjoyed the post. The talk was great, and beautifully illustrated. No one else goes to such great effort, but it paid off with a talk that stimulated a lot of interest. I want to print a poster of the sexfecta to post in the lab.